The holiday season is here and shoppers want modern point-of-sale technology to speed them through the showroom and the checkout lines. Are retailers and small businesses living up to customer expectations? According to Vend, the new brick-and-mortar is really “brick and click.” Looking at the opening cartoon by Marketoons, you get a real graphical representation about what this means: customers want the kind of show-me, touch-it service that only a real live human can provide in a showroom — which, thereafter, they whip out their smart phones or iPads, comparison shop, and purchase online. With Black Friday just down the street, and Christmas around the corner, the retailer just might be hampering sales and customer satisfaction by not getting past such thinking. Spending more time thinking about how customer behavior can, in fact, still make sales for his brick-by-brick establishment is a better use of energy. Forbes keeps its finger on the pulse of all things entrepreneurial and quoting an industry report from IHL Group informs retailers that “mobile in retail is now a $5.7 Billion business worldwide” with respect to POS equipment hardware and software. A strategist from ReachMail recently shared their infographic about mobile email marketing campaigns with me. Notably, the infographic was about email marketing but a couple of the statistics they’d gathered also made a clear case for retail mobile point of sale marketing. Their tongue-in-cheek advice? Wired Magazine took a look at how retail giant BestBuy strategized to take advantage of this facet of shoppers’ showrooming behavior. BestBuy’s CEO, Joly, acknowledged showrooming as “a threat” to in-store purchases but at the same time recognized the opportunity that was presenting itself. In their pilot project with customers looking to purchase high-end cameras, BestBuy has a sales representative actually greet customers with a tablet in hand, allowing them to comparison shop and finalize their purchase their way — whether in-store or even on BestBuy.com. Now that’s coming at the problem from an integrated vantage point … And coming to the floor ready to make a sale, no matter how it gets rung up. But, even if small retailers aren’t gung-ho to ditch their ubiquitous cash registers, replacing them for purely in-the-cloud technologies, numerous ones are likely to adopt a hybrid solution that involves a different kind of hardware and a more point-of-service approach. When I talk to small business owners, they don’t want to be left behind, or seen as dinosaurs, clinging to old-fashioned technology that doesn’t embrace their entire consumer market. A case in point are the small businesses mentioned in the USA Today article below. USA TODAY asks “What’s the best way for small business to grow” and provides examples of small businesses using mobile technology and social media marketing as a key answer. They relate a story about a food truck owner who started out using mobile point of sale hardware then was later able to move up to a brick-and-mortar store. The same article profiles a small business owner who says that after he bought a 100-year old coffee shop, he “saved up to $10,000 on traditional cash registers by using Square” and the iPad system in his coffee bar. See, “old-fashioned” isn’t a dirty word unless it hampers sales and doesn’t meet the needs of today’s modern consumers. How can you help them see the light? As we approach the holiday season, retailers in our customer base are likely too pressed for time to shift gears and go mobile this year. But the thing to keep in mind and remind them of as we kick off the upcoming new year? Holiday shoppers want to speed through purchasing gifts and they want to use the latest technological advances to make that happen. Wearing our hats as consumers of retail services and as small business consultants, let’s encourage small businesses and local retailers to give the gift of speed by upgrading their point-of-sale hardware to at least a hybrid system that incorporates mobile features. That, in turn, will delight customers with showroom showmanship. Myself, I’ll be giving both the PayPal mobile card reader and the Vend systems a tryout in 2014. What are your thoughts? Does your favorite retailer use modern mPOS technology that is delightful for you as a customer? As a small business consultant, are you having difficulties bringing your retail clients into the 21st century? Are you a service provider who is looking for ways your clients can pay you quickly, conveniently, in whatever venue you happen to be in? Feel free to share your thoughts and ideas below. Vernessa Taylor is a micro and small business champion who helps owners choose and use smart technologies in their businesses. She writes for a variety of business publications including SmallBizTrends, Business 2 Community, and Smart Data Collective. Hi Sherryl and Vernessa, How great to see the wonderful Vernessa here! Vernessa, you’re right, the best way for local retailers to stay ahead of the game is to adapt to modern technology. There is value to being able to shop at local stores and if we don’t patronize local establishments they won’t be around much longer. 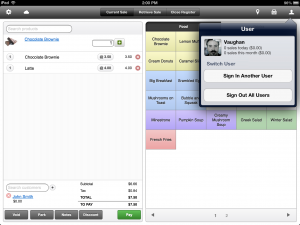 A local business uses Square on an iPad and have for years. I love how Square is empowering small businesses. If you go to a craft fair you often see small vendors who are now able to accept credit cards using Square. Before Square many of them would not have been able to take credit cards, impacting their sales. Today at The Wonder of Tech I reviewed the Galaxy Gear, which is a smartwatch with a camera embedded in the strap. I predict that soon apps will be available to let you scan bar codes and compare prices using the Gear. Thanks so much for enlightening us, Vernessa, on the ways that local businesses can compete with online stores. Now you’ve got me interested in another gadget — never heard of Galaxy Gear but sounds just like something the grandkids would want. Thanks for dropping by! I was very happy when Vernessa offered to write this guest post. It’s great to have a fresh voice on topics that I wouldn’t normally blog about. I had not heard of Square until I read Vernessa’s article. Then, I had to research it a little to learn more. This weekend, I’m going to my favorite craft fair of the holiday season. I am definitely going to pay attention to how vendors are processing their transactions. Sherryl, You may want to move to New Jersey. People aren\’t allowed to pump their own gas there. The price of gas is inexpensive as well. So you can get inexpensive gas pumped for you in New Jersey! Carolyn recently posted..The Best Holiday Tech Gifts for 2013! I know that Carolyn and I’m jealous. I used to work with a woman who was originally from New Jersey and whenever she came back from visiting family, she’d talk about how nice it was to have not have to pump her gas. I wonder if there are any other states out there that don’t allow it. I hope you had a nice Thanksgiving. I installed the coupon extension (that you blogged about) just in time for Black Friday. Sherryl, you can head to Oregon too. I lived in NJ for 11 years and most of the time having someone pump your gas is fantastic. But when you’re in a hurry and the guy is no where to be seen (they’re all guys), you wish you could hop out of the car and do it yourself. I’m so glad you downloaded Coupons at Checkout and used it to save with your shopping. I didn’t know Oregon had the same law Carolyn. I live in a small New England town in MA and there is a woman (in about her twenties) who pumps gas at a local station. Also, I never have to wait for someone either there or at the other full service station (in another small town) that I often frequent. Both of these stations are owned by sole proprietors (men) who also run garages. The station in my town also has a small convenience store that his wife runs and you can often see their two school-age children doing homework at a small booth. Ahem! I occasionally watch the Andy Griffith show, but I watch Matlock daily! LOL And … Aunt Bea was a Carolina girl who lived right down the road from me (probably less than an hour away). I’m sorry for not adding to the conversation earlier. I was on a mission and confess that I didn’t read the article. I have now read it and want to offer my opinions. I think that retailers should make buying easy by having the floor rep urge people into the sales and have a device on hand for alternate forms of payment. I also think that maybe they should offer customers another incentive by giving a discount if they “buy now” – when the customer is in the store. Since many prices are marked up if they offered even a five percent discount they will still make money. One sale at a discounted price is better than no sale at all! Thanks for dropping by! Honestly, I don’t envy anyone in retail these days. As someone who prides themselves in being a savvy shopper, the problem with discounts is that becomes the price. For example, I wouldn’t dream of shopping at Bed, Bath & Beyond without either a 20% off coupon or a $5 off $15. They’ve absolutely glutted the marketplace with their promotional materials. On the other hand, I will pay slightly more for an item if it’s a small out of the way shop where I’ve made a personal connection with someone (for example, the only independently owned hardware store within a 10-mile radius). I need to join a conversation on your blog too! I’ve been absolutely swamped lately. Hi Lorraine – Now that’s a novel idea to offer an in-store discount IF the customer buys while in the store. Sherryl brings up a good point about the discount become THE price in the minds of consumers. Both points taken together are still a Win-Win for both customers and big retailers, as underscored by an expose in Forbes about just how much retail prices are marked up around the holidays. It’s only the small, local stores that can’t afford to offer deep discounts more than once or twice a year (if that). Appreciate your insights! I LOVE the cartoon. 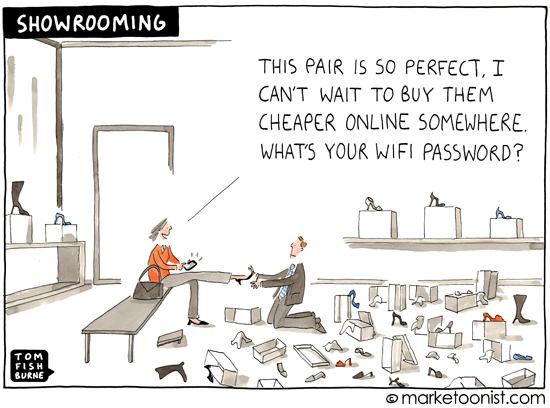 It is so true and so relevant for today’s retail space. For the very busy person the online availability of stuff is awesome. I must to an oddball because I still enjoy shopping the old fashioned was when I have the time. That’s the key when I have time. I’m looking forward to a good trip to our local mall myself Susan. What worries me is that eventually there will be very few local businesses left. Already, the mall near me is a ghost town. There are so many vacant storefronts that it’s depressing. Eventually, we’re going to be left with a few big box stores and that will be it. I always think the same thing about self-serve gas stations. Call me spoiled but I don’t pump my own gas. It’s something that I’ve always been willing to pay a little extra for. (Actually, around this area, you can find full-serve stations that will pump your gas for several cents less than the cost of self-serve at some of the bigger chains.) If we don’t support them now, these businesses won’t be around when we need them. I really did put it on my Kindle Wish List and plan to grab it for one of my own stocking stuffers. That cartoon jumped out at me and actually helped me flesh out the concept for the article. That Marketoon dude is soooo on point! If you ever do book signings at a local coffee shop or bookstore, you can take that opportunity to experiment with using Square or Vend or one of the apps that let you make sales from any venue. Square is one of my favorite tools as a public speaker with books to sell! I always carry it with me in case someone does not have 20 bucks but has a credit card. Recently at a women’s conference in LA, an outside vegan food caterer came in and their buffet was one of our choices for meals at a Marriott. Instead of cluncky register or the old timey card swipes, Square was the payment venue! over from LinkedIn group BHB. I’ve been out of town for days so thank you so much for chiming in here and hope you (and everyone here who celebrates) had a wonderful thanksgiving. That’s an excellent idea to pose the question to the BHB group. I’ve just joined and looking forward to participating in some enlightening discussions. Patricia, what you’re doing is definitely the next step for consultants, authors and entrepreneurs who are not “retail businesses.” In fact, that’s the subject of my next article around this whole mobile sales phenomenon. Personally, I didn’t know anyone who actually used Square in their business so thanks for letting us know about your own experience. Of course. Nothing can replace the human to human interaction. Lot of businesses are paying more attention to customer experience and how their customers actually feel (which, in the end, is good). I think, for salespeople, it all comes down to making those conversations. They have to try and make a “friend” out of the customer (right? I actually don’t have any experience with selling things, so I might be wrong here. I have had my fair share of dealing with readers..providing them a good experience in my blog). Nope. But, businesses don’t do that, do they? (I suppose the owners are better off with not crediting a mobile purchase to a salesperson). Sales is not my strongest suit either but as a potential customers, I agree with you that salespeople need to connect with us. As I read the Wired article, I couldn’t help but think about my personal experiences with Best Buy, (and Circuit City before them). Where Best Buy (and other big box stores) miss an opportunity to differentiate themselves is when they have uninformed sales people reading products specs off of boxes. We can all research product info online. The biggest advantage of brick and mortar stores is being able to have a real person educate us and earn our trust. I’m eager to patronize local stores and I’m willing to pay a little more but only if they add value to my experience. As always Jeevan, thanks for dropping by and adding to the conversation. I remember the last time I went to Best buy (couple of months ago, to buy a laptop). The sales reps had no idea about the specifications of laptop. I suppose it is okay – I mean, we can’t expect them to know the specifications of every laptop, right? (But, they should at least know the basics, such as what a feature means and how it can benefit the customer). I also like the Best Buy strategy. I dare say that this online phenomena will continue to grow with Google now testing 1 hour delivery in certain markets. I am sure Amazon will follow. The brick and mortar store is being replace by huge distribution centers. Jacqueline Gum (Jacquie) recently posted..Thanksgiving Turkey Neck… WHERE’S THE JUSTICE? That is so true Jacqueline. The retail “Goliaths” (like Google and Amazon) are increasingly replacing brick and mortar businesses. Personally, if I can, I try to shop from smaller online vendors (to help spread the wealth a little). Thanks for dropping by and sharing your thoughts with us. And guess who else has jumped on the same day/1-hour bandwagon? eBay! After this article went to press, I was reading in one of the popular magazines about eBay testing out same day delivery in New York (using bikers, walkers as shoppers). I don’t suppose the really big brick-and-mortars have much to worry about (like Macy’s, Bloomingdales, etc.) because people still love the hustle and bustle of shopping, fitting rooms, and trying before you buy. But the smaller brick-and-mortars will have to constantly find ways to differentiate. You are absolutely right that retailers have to adapt to our online world. If not, they will lose out. We all shop online simply because we save a lot of money buying the same thing online we could buy in the shop. Best Buy’s strategy appeals to me. Part of me thinks it’s a shame that we buy more and more online. But having said that I do it all the time. I try to buy locally when I can but I shop a lot online too. It’s so convenient and the prices are so competitive that it just makes sense. When free shipping is involved, we save even more money. The problem is that we end up not having local stores to patronize. I think book stores is an excellent example. There are very few bookstores left where I live and it’s a shame. Going to a bookstore and being able to browse, read and shop is not the same experience online. Funny thing about the Best Buy strategy: the last time I purchased something at Best Buy, I didn’t shop online as I usually do. I actually called one of the local stores (there are several in my area), found out they had what I wanted in stock, and sent a family member who lived closest to that store to pick it up. I agree with you and Sherryl — shopping online saves money but I do miss the flavor of local shops! It is interesting that in the early 90’s when I decided to sell promotional products on the internet I was told it would never work. Today the competition is so intense with companies selling to corporations. Corporations like to be able to buy over the internet because they don’t have time for sales people to stop by and show them our products. That cartoon really says what is happening. I see it my business where someone will buy for another competitor if they are a penny less. I have gotten more calls to match or give a better price than a competitor. I have thought about offering price matching. The problem with that is a see a greater price war. You are so right about competing on price alone. It does create price wars and what you end up doing is concentrating on acquiring new customers rather than retaining current customers. What you’re doing with social media and your blog is differentiating your company. It should prove to be an effective strategy. Thanks for sharing your thoughts with us. I hope you’re having a nice Thanksgiving. Sherryl is spot-on about differentiation. Often, I’m tempted to do the price-matching dance, too, skipping around to check out competitor’s prices. Usually, with just a few bucks difference in the price, I won’t necessarily go for the lower price. I’m looking for that “something” that sets those competitors apart and usually something like customer service or free shipping does it for me. I like the Best Buy strategy Vernessa, as it simplifies the experience for the customer and would save them time by having the comparison on hand. Let’s face it other retailers could do the same as they all know what their competitors are pricing products at. I know in my country there are still retailers hesitant to embrace technology. Maybe it is a case of consultants or whoever are making the area too complicated and overwhelming. You know, Best Buy’s strategy really resonated with me. too. I’m sure other retailers are doing it (too bad I haven’t actually experienced it at *any* retailers) but with the proliferation of sales of this type of retail hardware, somebody (besides Best Buy) is doing it somewhere. As a service business, and with clients who run service businesses, I’ve long wanted an easy way to have someone make a payment even while we were sitting in a coffeeshop signing a contract. So, we’ll see if this easier method will help those reluctant to embrace technology slide onto the bandwagon. So, do businesses still reprimand (or encourage) their employees for not making any in-store sales? (I mean, businesses who spend a considerable amount of time and effort into mobile marketing). If they do, is that really fair? I suppose a good salesman should be able to convince the customer to make an in-store purchase, right? (Plus, businesses should take the opportunities presented by mobiles/tablets). As a customer, I am glad that I get to make purchases online (and save money while doing it). But, I am a bit nervous (I mean, this sort of development will only increase our dependence on gadgets such as cell phones). Anyways, thank you for the post, Vernessa 🙂 Appreciate it! That’s an excellent question that I’d like to know the answer to, too! We could hazard a guess that salespersons who earn commissions are not only externally encouraged to make in-store sales but are themselves highly motivated to do so. It goes without saying, the commission check does its own reprimanding. But as far as store owners go, any reprimand should actually not be punitive; it should manifest in the form of more sales training or better closing techniques, etc. Really, mobile technology should not replace in-store sales, it should be used to help enhance the customer’s experience and give salespeople more of what they need to satisfy customers. I can’t see any reason that a sale made in the store, even using mobile technology, couldn’t reward any salesperson that helped close the sale. Can you? Previous post: Are You Ready for Business Black Friday Weekend and Cyber Monday? Next post: Do You Use Google Webmaster Tools Bing or Both?